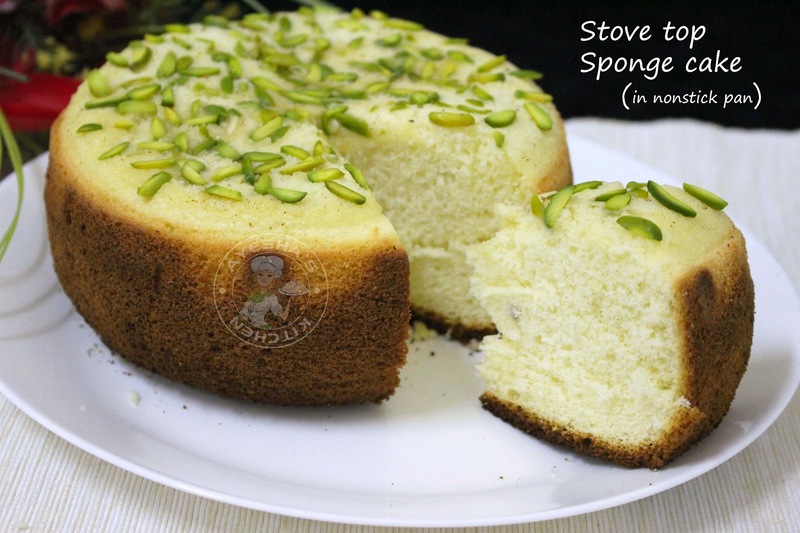 Here is a light and delicate sponge cake on stove top with only three ingredients. No baking powder, no baking soda, no vanilla and no oil .And the most important part is...here the cake is prepared in a nonstick cookware. It is quite interesting and wonderful. right? A three ingredient cake recipe. This is one of the traditional ways for baking cake without an oven. All credit for this recipe goes to my aunt, Hairu, she was the cooking queen in our family when I was a kid. Still, I remember those lovely days, she used to make creative snacks and sweets and even bakes on the stove top. Those days, approximately 15 years back ( no internet..no wifi..even no mobile facility) I wonder how she is able to cook food creatively. Still, I admire her cooking style. We all know that baking powder and baking soda is an important leavening ingredient in cakes and bakes. But if you do not have this while preparing for a cake recipe, don't feel desperate. Still, you can do with this simple technique given in the recipe below. You can also make a chocolate cake by adding cocoa powder (flour/ maida must be reduced then) to the same recipe or can make pineapple pastry or can decorate this simple sponge cake with your favorite icing or frosting. 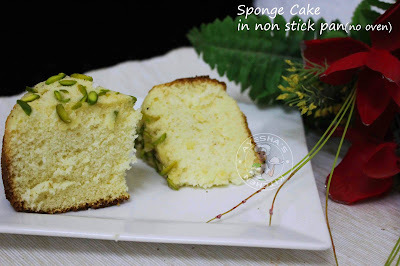 You can also add Nutella or hazel nut spread to this sponge cake recipe for a yummy Nutella cake. 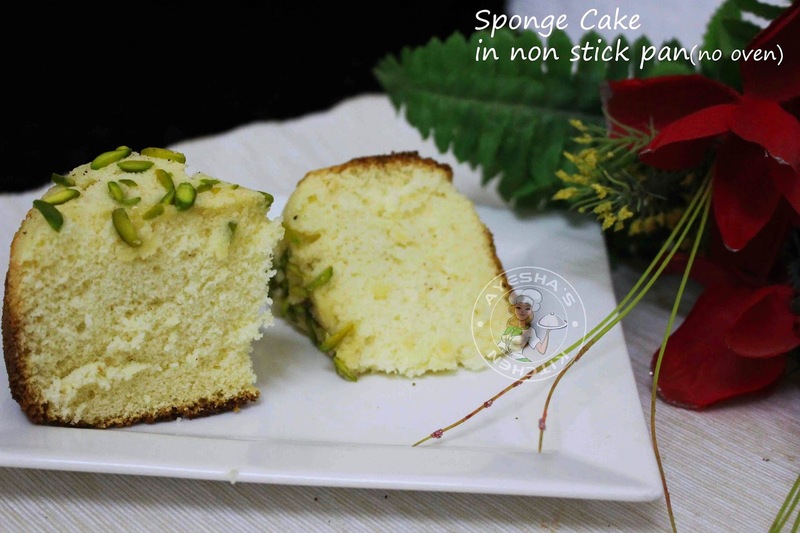 For vanilla sponge cake recipe, add a teaspoon of vanilla essence or vanilla powder instead of cardamom powder. Hope you all will try this stove top oven recipe. Me here, waiting for your valuable feedback. 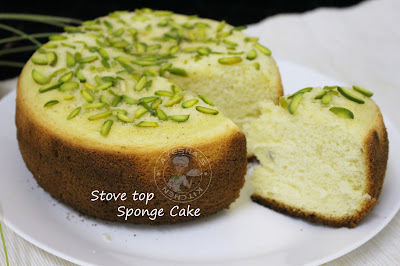 Here is the recipe showing how to make fluffy sponge cake recipe/recipe for a sponge cake / 3 ingredient recipes/cake recipes/ stove top cakes/cake in a non-stick pan/cookware cake stove top. Enjoy. Also please check how to make thaen nilavu, a kids' sweet recipe in my youtube videos. Set aside these ingredients ready. Take eggs, cardamom powder ( or vanilla if using instead) and sugar in a large bowl. Whisk them well until soft and fluffy. This makes the cake soft and raise. So you have to beat them well using electric whiskers until soft peaks are formed. It will take around 5 - 8 minutes. Check the image given below. When done, sift the flour into this mixture. Do not use electric whiskers or beaters to mix the flour with egg mixture. Just fold them gently. Combine well. Be careful never beat after adding flour mixture. You must only fold the flour mixture into egg mixture while baking a cake. Heat a non-stick cookware. I used small round cookware only. Grease it with butter/oil/ghee. Once hot, make the flame very low and then Pour this prepared airy batter to the pan. Close the lid and cook for 20 - 25 minutes over a low flame. You can also bake this cake in a preheated oven at 150 degrees C for 30 minutes. After 20 minutes insert a toothpick and if it comes out clean then the cake is done. If not, let it cook for few more minutes or until done with closed lid. You can decorate the cake with nuts or pistachios in between. When done, off the flame. Take the cake out after 5 minutes. Let it cool completely and then slice. You will not get a perfect slice when the cake is warm. But you can't wait for long like me. I just slice immediately and that results in that imperfect slice. Anyway, the cake was soft, moist, fluffy as the name says...a spongy cake ever. If you grease the pan with more or less butter/oil, you will get a crusty sided cakes. So grease moderately. Not more not less. ANY CRACKS IN CAKES - Then you might have used more raising agents or the use of a small baking pan or you must have baked at too high temperature. So check this properly. Once my loaf cake faced this problem because of the use of small baking pan. Do not interrupt the oven or stove top pan while baking. The cool air entering the oven or pan will disturb the cake to set properly. ANY AIR BUBBLES ON TOP - lack preheating the oven. MUST FOLD AFTER ADDING FLOUR - Never whisk the cake batter after adding flour mixture. Just fold them well. Or can whisk for 10 seconds or little more. Not more than that.